Definition at line 235 of file global.h. Definition at line 325 of file global.h. 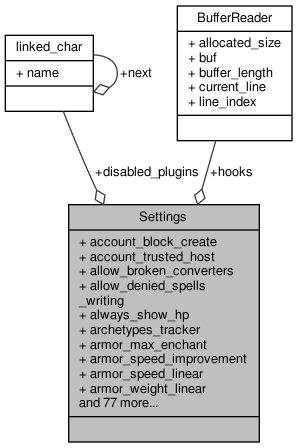 Referenced by account_block_create(), and load_settings(). Block account creation for untrusted hosts. Trusted host for account creation, defaults to 127.0.0.1. Definition at line 326 of file global.h. If set, converters will work even if price of generated item is higher than the price of converted items. Definition at line 313 of file global.h. Referenced by convert_item(), and load_settings(). If set, players can write spells they can't cast. Definition at line 312 of file global.h. Referenced by command_settings(), load_settings(), and write_scroll(). Definition at line 269 of file global.h. Referenced by check_probe(), and load_settings(). Definition at line 246 of file global.h. Referenced by cctk_init_std_archetypes(), init_environ(), load_archetypes(), and set_archetypes(). Definition at line 302 of file global.h. Referenced by improve_armour(), and load_settings(). Definition at line 305 of file global.h. Definition at line 306 of file global.h. Definition at line 304 of file global.h. Definition at line 303 of file global.h. Definition at line 257 of file global.h. Referenced by kill_player_not_permadeath(), and load_settings(). Definition at line 266 of file global.h. Referenced by attack_ob_simple(), cast_spell(), command_settings(), load_settings(), object_clear(), process_events(), process_players1(), and rangetostring(). Definition at line 241 of file global.h. Referenced by cctk_setconfdir(), cfapi_system_directory(), checkbanned(), checkdm(), display_motd(), forbid_play(), init_experience(), init_startup(), init_stats(), load_settings(), metaserver2_init(), send_file(), send_news(), send_rules(), and set_confdir(). Definition at line 308 of file global.h. Referenced by cast_create_town_portal(), command_settings(), and load_settings(). Definition at line 327 of file global.h. Referenced by crypt_string(), and load_settings(). Definition at line 237 of file global.h. Referenced by init_server(), metaserver2_init(), and set_csport(). Definition at line 242 of file global.h. Referenced by cctk_setdatadir(), cfapi_system_directory(), command_help(), create_pathname(), find_help_file(), find_maps(), find_style(), MessageManager::findPrePost(), help_topics(), i18n_init(), init_anim(), init_artifacts(), init_attackmess(), init_emergency_mappath(), init_environ(), init_formulae(), init_msgfile(), init_races(), init_regions(), load_archetypes(), load_materials(), load_quests_from_file(), load_treasures(), MessageManager::loadDirectory(), QuestManager::loadQuestFile(), MessageFile::parseFile(), read_bmap_names(), read_client_images(), read_face_data(), read_smooth(), MessageFile::save(), QuestManager::saveQuestFile(), and set_datadir(). Definition at line 256 of file global.h. Referenced by apply_death_exp_penalty(), command_settings(), and load_settings(). Definition at line 255 of file global.h. Definition at line 238 of file global.h. Referenced by command_debug(), LOG(), main(), set_debug(), set_mondebug(), and unset_debug(). List of disabled plugins, 'All' means all. Definition at line 323 of file global.h. Referenced by free_server(), initPlugins(), and set_disable_plugin(). Definition at line 277 of file global.h. Definition at line 240 of file global.h. Referenced by init_beforeplay(), and set_dumpmont(). Definition at line 239 of file global.h. Referenced by init_beforeplay(), set_dumpmon1(), set_dumpmon2(), set_dumpmon3(), set_dumpmon4(), set_dumpmon5(), set_dumpmon6(), set_dumpmon7(), set_dumpmon8(), set_dumpmon9(), and set_dumpmont(). Definition at line 296 of file global.h. Referenced by enter_player_maplevel(), enter_player_savebed(), free_globals(), init_emergency_mappath(), kill_player_permadeath(), and save_player(). Definition at line 297 of file global.h. Referenced by enter_player_maplevel(), enter_player_savebed(), init_emergency_mappath(), and kill_player_permadeath(). Definition at line 294 of file global.h. Referenced by block_until_new_connection(), and load_settings(). If set, don't check plugin version. Definition at line 324 of file global.h. Referenced by load_settings(), and plugins_init_plugin(). Definition at line 300 of file global.h. Referenced by apply_check_item_power(), command_settings(), improve_armour(), improve_weapon(), and load_settings(). Definition at line 243 of file global.h. Referenced by account_char_load(), account_char_save(), accounts_load(), accounts_save(), apply_race_and_class(), cast_create_town_portal(), cfapi_system_directory(), check_login(), checkbanned(), command_banish(), command_players(), create_items_path(), create_overlay_pathname(), create_template_pathname(), dead_player(), delete_character(), enter_exit(), enter_player_maplevel(), enter_unique_map(), hiscore_init(), in_localdir(), init_book_archive(), init_clocks(), init_environ(), is_legal_2ways_exit(), key_change_class(), key_confirm_quit(), knowledge_read_player_data(), knowledge_write_player_data(), main(), CREMainWindow::onReportQuests(), quest_read_player_data(), quest_write_player_data(), read_map_log(), resurrect_player(), save_player(), set_localdir(), START_TEST(), verify_player(), write_book_archive(), write_map_log(), and write_todclock(). If set, log will comport a timestamp. Definition at line 315 of file global.h. Referenced by load_settings(), and LOG(). Format for timestap, if log_timestamp is set. Definition at line 316 of file global.h. Definition at line 236 of file global.h. Referenced by cctk_setlog(), init_globals(), LOG(), main(), and set_logfile(). Definition at line 245 of file global.h. Referenced by cfapi_system_directory(), create_overlay_pathname(), create_pathname(), find_maps(), MessageManager::findPrePost(), init_emergency_mappath(), init_environ(), init_regions(), load_quests_from_file(), MessageManager::loadDirectory(), QuestManager::loadQuestFile(), MessageFile::parseFile(), MessageFile::save(), QuestManager::saveQuestFile(), and set_mapdir(). Definition at line 299 of file global.h. Referenced by add_player_exp(), CREExperienceWindow::CREExperienceWindow(), dragon_eat_flesh(), dump_experience(), fix_object(), init_experience(), level_exp(), monsterFight(), CREMainWindow::onReportSpellDamage(), player_lvl_adj(), send_exp_table(), and shop_bargain_multiplier(). Definition at line 321 of file global.h. Referenced by attempt_steal(), change_abil(), check_race_and_class(), command_abil(), do_symptoms(), do_throw(), fix_object(), fix_player(), get_cha_bonus(), get_cleric_chance(), get_con_bonus(), get_dam_bonus(), get_dex_bonus(), get_fear_bonus(), get_grace_bonus(), get_learn_spell(), get_sp_bonus(), get_speed_bonus(), get_thaco_bonus(), get_turn_bonus(), get_weight_limit(), init_stats(), kill_player_not_permadeath(), load_settings(), load_table_float(), load_table_int(), and pick_up_object(). Definition at line 286 of file global.h. Definition at line 284 of file global.h. Definition at line 282 of file global.h. Definition at line 285 of file global.h. Definition at line 283 of file global.h. Definition at line 274 of file global.h. Referenced by display_motd(), load_settings(), and send_file(). Definition at line 276 of file global.h. Referenced by send_file(), and send_news(). Definition at line 307 of file global.h. Referenced by attempt_steal(), command_settings(), and load_settings(). Definition at line 258 of file global.h. Referenced by command_settings(), kill_player(), and load_settings(). Definition at line 254 of file global.h. Referenced by add_player_exp(), calc_perm_exp(), check_exp_loss(), command_settings(), load_settings(), and show_skills(). Definition at line 309 of file global.h. Referenced by apply_check_personalized_blessings(), god_enchants_weapon(), and load_settings(). Definition at line 253 of file global.h. Referenced by kill_object(), and load_settings(). Maximum experience one can get for PKing. Ignore if negative. Definition at line 310 of file global.h. Percentage of experience of victim the killer gets. Definition at line 311 of file global.h. Definition at line 244 of file global.h. Referenced by apply_race_and_class(), cfapi_system_directory(), check_login(), command_players(), dead_player(), delete_character(), enter_unique_map(), init_environ(), key_change_class(), key_confirm_quit(), knowledge_read_player_data(), knowledge_write_player_data(), CREMainWindow::onReportQuests(), quest_read_player_data(), quest_write_player_data(), resurrect_player(), save_player(), set_playerdir(), and verify_player(). Definition at line 267 of file global.h. Referenced by command_abil(), command_addexp(), command_create(), command_nowiz(), command_patch(), load_settings(), pay_for_item(), and pick_up_object(). Definition at line 268 of file global.h. Referenced by clean_tmp_files(), load_settings(), and swap_map(). Definition at line 247 of file global.h. Referenced by init_regions(), and set_regions(). Definition at line 260 of file global.h. Definition at line 262 of file global.h. Referenced by command_settings(), kill_player_permadeath(), and load_settings(). Definition at line 320 of file global.h. Referenced by load_settings(), and roll_stats(). Definition at line 275 of file global.h. Referenced by send_file(), and send_rules(). Definition at line 263 of file global.h. Referenced by check_login(), check_pick(), command_search_items(), fix_player(), and load_settings(). Definition at line 271 of file global.h. Referenced by command_settings(), hit_player(), and load_settings(). Definition at line 261 of file global.h. Referenced by check_login(), command_settings(), command_title(), key_confirm_quit(), kill_player_permadeath(), load_settings(), and save_player(). Definition at line 259 of file global.h. Referenced by calc_skill_exp(), kill_object(), and load_settings(). If set, then submaps in random maps can break the walls. Definition at line 322 of file global.h. Referenced by find_spot_for_submap(), and load_settings(). Definition at line 264 of file global.h. Referenced by command_settings(), fix_object(), and load_settings(). Definition at line 265 of file global.h. Referenced by cast_spell(), command_settings(), load_settings(), scroll_failure(), scroll_type_apply(), spell_failure(), and spellbook_type_apply(). Definition at line 270 of file global.h. Referenced by load_settings(), and SP_level_spellpoint_cost(). Definition at line 318 of file global.h. Referenced by create_player_cmd(), load_settings(), and send_new_char_info(). Definition at line 317 of file global.h. Definition at line 319 of file global.h. Definition at line 252 of file global.h. Definition at line 250 of file global.h. Referenced by create_template_pathname(), init_environ(), and set_templatedir(). Definition at line 251 of file global.h. Referenced by cfapi_system_directory(), init_environ(), save_map(), save_player(), and set_tmpdir(). Location of the treasures file. Definition at line 248 of file global.h. Referenced by cctk_init_std_archetypes(), init_environ(), load_treasures(), and set_treasures(). Definition at line 249 of file global.h. Referenced by cfapi_system_directory(), create_items_path(), init_environ(), and set_uniquedir(). Definition at line 272 of file global.h. Referenced by list_players(), and load_settings(). Definition at line 273 of file global.h. Definition at line 288 of file global.h. Referenced by command_loadtest(), and load_settings(). Definition at line 289 of file global.h. Definition at line 292 of file global.h. Definition at line 293 of file global.h. Definition at line 290 of file global.h. Definition at line 291 of file global.h.